I was browsing through my thousands of images in my laptop, searching and shortlisting suitable pictures of Dot that I would like to print them on canvas and have them framed. Finally I found two pictures that I love – one taken by my friend and the other by yours truly – to be printed on canvas and framed. 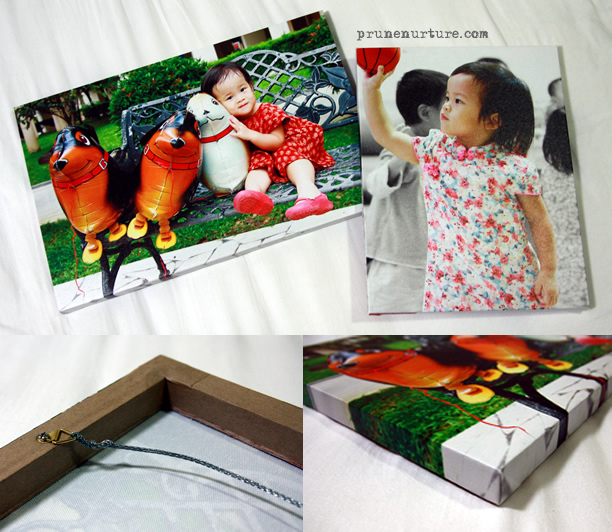 Spicycanvas kindly sponsored these two customized photo canvases of different sizes. I like it that they are light and are easy to hang up; the finishing at the back of the canvas is nicely covered. Overall, they are beautifully and nicely done. When Dot’s room is ready, these pictures will be up in her room. Here’s the good news! Spicycanvas is currently having promotional prices for Giclee canvas printing which are valid till 31 Dec 2013. Click this link to see the promotional prices. You are entitled to an additional 5% discount on regular items by just quoting the discount code “Dee05“. Photos are not meant to be kept in the computer….